Alcohol content: 12,5 % vol. – 13,5 % vol. Grapes: 100% Aglianico del Vulture. Low espalier training system, average plant density of 5000 vines per hectare with an average yield of 7000 kg of grapes and 4800 liters of wine. Medium texture volcanic origins soil of the Vulture area. Winemaking: The grapes, harvested within mid October, are softly pressed. The free run juice slowly ferments at controlled temperature. Upon bottling, the wine is put on the market after a short bottle ageing. Description: Lively cherry color, clear. 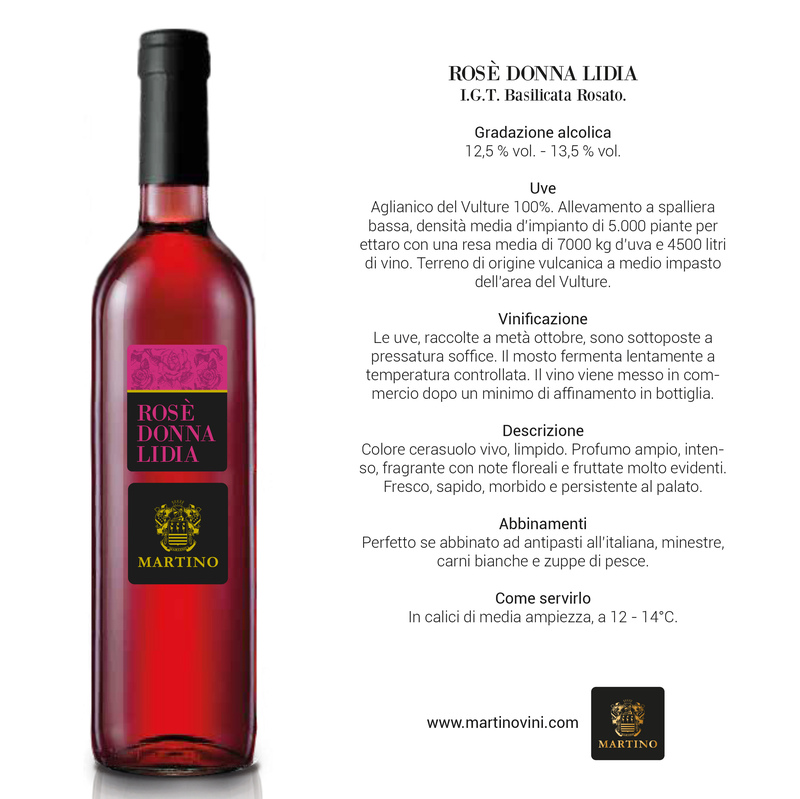 Wide, intense, fragrant bouquet with very evident floral and fruity notes. Fresh, savoury, smooth and persistent on the palate. Pairing: Perfect paired with Italian style antipasti, soups, white meat and fish soups. How to serve it: In medium width stem glasses, at 12 – 14°C.